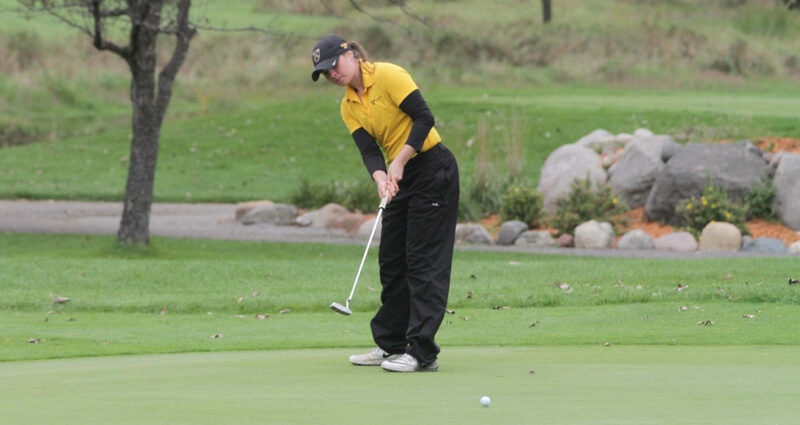 NORTHFIELD, Minn. – The Gustavus women’s golf team Saturday competed in the Carleton Spring Invitational at Willingers Golf Club and tallied a 335 in the first of two rounds, which is tied for fourth place. McKenzie Swenson (Sr., Buffalo, Minn.), Kristen Cash (So., Roseville, Minn.), and Jessica Nelson (Sr., Plymouth, Minn.) each fired an 82 to lead the Gusties and are tied for 17th place. Ellie Brandt (Jr., Wayzata, Minn.) posted an 89 ans is tied for 32nd, while Morgan Bleyhl (So., Elk River, Minn.) carded a 91 and is tied for 38th. The second round begins at 1 p.m. Sunday.